יהודי התקשר לביתו ואשתו אמרה באותה עת "פרק שירה". כשהרימה את השפופרת אחזה במילים: "חמור מה הוא אומר?" הבעל בשמעו את המילים הללו טרק את הפלאפון ומיהר לבית הרב. "אני רוצה גט על אתר, אשתי לא תבזה אותי בצורה כזו יותר". לא הועילו השכנועים של הרב, לא הצליחו המילים להרגיעו. בלית ברירה נכתב גט לאשה. "אמרתי 40 יום פרק שירה ונושעתי". Mr. Daily Yid got on my case this morning: Hayetochen I didn't write about the ex-Lubavitcher fashion designer who wrapped his models in Sefer Torah Mentlech??? And his "inspiration" was supposedly a Baal Shem Tov vort he heard as a kid; that every yid is a like farmachte sefer torah etc. What can I say? Lubavitchers, when they fall they fall to the lowest levels, as do Jews in general. I've repeated this a hundred times, and I think I stay true to my word: I'm not a news blog, and I don't report scandal for the most part. The prrof would be in the following two stories that I didn't cover: the Lakewood kid with the Brisker Peyos (at least he USED to have them) who robbed a jewelry store with a shotgun, and then delivered some of the goods to his father's house, presumably because he felt guilty or something. Very smart, kiddo, implicate your parents at the same time. Then there was the Satmarer kid who went and OD'd last week. So, in case you have kids take them and lock them up, because nobody's safe anymore. When discussing the passing of Reb Eli Teitelbaum, the fact that he learned in Lubavitch was mentioned by me. Which reminds me; did the obituaries mention that fact? I wonder... Anyway; So the talk began as to why his father, a Ruzhiner Chossid, would send to Lubavitch. After all, there were other bastions of Torah like Yeshivas Moreinu Harav Chaim Berlin, and Yeshivas Harav Yaakov Yosef, and Yeshiva Torah Umada- I mean Torah Vodaas, so why send to a place where they probably just learned Tanya all day and kissed the Rebbe's picture, right? Obviously, instead of most people changing their perceptions about what a Lubavitcher Yeshiva was or still is, they instead make themselves happy by convincing themselves that it was Lubavitch that changed, and that they're right for changing their attitude towards Lubavitch. Fine, let them think so. The point here is this: ALL Yeshivos push their agenda, most of them anyway. Whether it's the Yeshivishe Agenda, The Chassidishe Agenda, or the Zionist Agenda, it's no different anywhere. The reason you may not see it somewhere else is simple: they have nothing to offer. Then there are those that push even if they have nothing (really) to offer. In Spinka we would all travel to the airport to greet the Spinker Rebbe when he would arrive from Israel. Why? why be mevatel the learning of tinokos shel bais rabbon just to welcome him at the airport when the same can be done in the yeshiva? And why Bichlal involve little kids who nothing about the Spinka Rebbe, and are not Spinka Chassidim? Is that why their parents sent them there, to make kabbolas ponims for the Rebbe? I guess if it's an innocent little KP it's ok, after all, what's the worse that could happen, my son will become a Spinker Chossid? Nisht Geferlich. Those of you who are either alumni of Stoliner Yeshivah in BP, or know those that are, will recognize that the Stoliner Cheder was, and is to a lesser extent, a major "factory" (for lack of a better term) of gaining new Chassidim. DeHaynu, that they managed to build up a whole thriving chassidus mostly on Tzugekummener American/Litvishe kids, most of who's parents never dreamed that their children would become farbrente chassidim of a young bochur who they were told has super powers and knows what they're thinking just by looking at them. Many, many of the Choshuvste yungeleit there are from Litvishe homes, and they were actively recruited to be Stoliners while in yeshiva there. 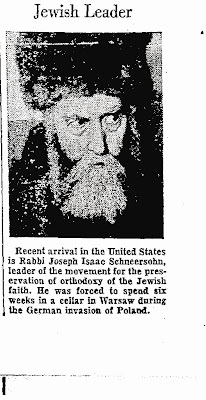 I believe the same goes on today, and rightfully so; any person who sends his child to a yeshiva run by Stoliner Chassidim should realize that there the chance that his son will begin subscribing to their way of thinking, whether they say it explicitly or not. I guess maybe the old Rabbi teitelbaum was thinking that too; if my son becomes a Lubavitcher iz oych nisht geferlich, besser vi a l-----. "You have no idea how much I miss the Rebbe." These words were the last that Rabbi Eli Teitelbaum, z"l, said to a renowned Crown Heights Rosh Yeshiva two weeks ago. The two had been friends for over forty years, and had been discussing sichos of the Rebbe, amongst inyonei haklal. These words are probably not what you'll see in the obituaries this week, but they're true nonetheless. You may see others forget that he learned in yeshiva; they may just talk about his great accomplishments, but that won't change the facts. The little kuntres on the table further proves my point. Reb Eli was a talmid of Tomchei Tmimim throughout his late childhood and adult yeshiva life. He was a chossid of the Rebbe with all his heart, and had great tza'ar seeing what others had made of the Rebbe after his passing. RET's passing came as a great shock to all that ever benefited from any of his endeavors, and they are in the many tens of thousands. He had "mazel" that his passing was made public the same day that the world learned about the Dunner tragedy; since he'd probably not like all the fuss that's made of him. HIs father, Harav Avrohom Yakov, z"l, was an old time Rav for whom both the Lubavitcher Rebbe and Satmar Rov, zt"l had great respect. Eli's friends tell me that his father was the go-between for the two, the shliach if you will. He was also what you might call a Ruzhiner Kano'i, a talmid of the great Rav Meir Arik, and a Kopycynitzer/Husyatiner Chossid. Why he sent his sons to Lubavitch, and not to Chaim Berlin or Torah Vodaas is anybody's guess. While all of London mourned, and the Rebbes of Bobov 45 and Skver flew off to London to attend the Levaya, they went on as if nothing happened. The all-important "play" had to go on, as did the Shushan Purim Tish, complete with loud singing and music. BZ Dunner was the Bobov 48 Rebbe's cousin too, just like he was the Ungers', and despite him supporting the "other side" the least they could do is show the world that they won't play politics with the tragic death of a family member. I guess we expected too much, eh? It's been a long time since the death of one individual caused such a stir amongst so many people. Bentzi was a special Baal Tzedokoh, one who gave because he wanted to help everybody and every institution that came asking for help. His loss is irreplaceable. May we hear only good news. A Message To Chikave Balabuste! Check the Hachnosas Sefer Torah pic, I got an enlarged version of it. 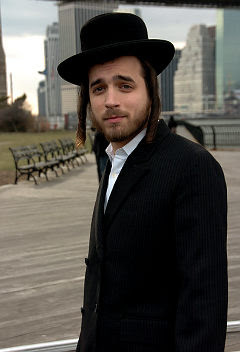 You may have read about the Chasidic Actor who starred in a movie being filmed in Brooklyn, under the Brooklyn Bridge to be exact. He starred next to an Israeli actress, and together they portrayed a Chassidishe couple. (I think.) When I first saw the pictures on the The Daily Yid I wondered how they dressed up a guy so well. Then I began to hear that it's no dressup; the guy's a regular Williamsburger who decided to make a few bucks, so he went and signed up, and was accepted. After all, why dress up a guy with a bad-looking beard and Peyos, when you could get the real deal right here in Brooklyn! Now, after a few days of talk about this "Pirtzeh," it seems like he backed out, citing community and family reasons. That makes you wonder: what was he thinking? did he think that nobody would find out, and that he'd just do the job and get paid without anybody knowing? We may expect an Oofgeklerter maybe to think that as long as there's no actual issur happening, that somehow he was permitted to act alongside a woman, since maybe he can influence her in a positive way, but a Satmarer??? Is the day the FR arrived in America, escaping Nazi Europe through Latvia, and sailing across the dangerous Atlantic. The following are a few newspaper clips announcing his arrival. PLEASE REALIZE THAT THE QUESTION IS TZEMACH'S, AND NOT NECESSARILY IS HE ACCUSING THE CHERNOBLER HERE. HE'S ASKING. All the Reb Nochum Chernobeler einiklach AKA Twerskys; they ruled over a large part of Ukraine virtually exclusively. Not counting Breslevers and the Ruzhiner who left, Twerskys had an exclusive hold on the vast and prosperous North Eastern part of Ukraine for a century. Speaking in American terms, what is the legacy? So the first Rebbe wrote Meor Einayim. But after that; what has this dynasty accomplished, and I don't mean that Fishel Shneerson was a fine psychiatrist or that Talner Tewrsky was a fine Harvard professor. What have the Twerskys done for the Jewish People during their 100 year reign? 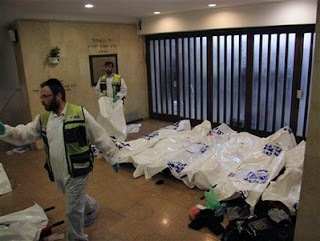 Chaim Berlin Tragedy Commenting on Circus Tent: My, How You've Grown! "Baalbatish" goes in all sorts of directions, and says "Interesting how Chaim Berlin/Fruchthandler pop up in the Belzer story." This is no accident, because "Chaim Berlin/Fruchthandler" put down a lot of money to buy karka in the same spot in Yerushalayim where the Belzer Rebbe had his eye to build his mega-shtiebel. 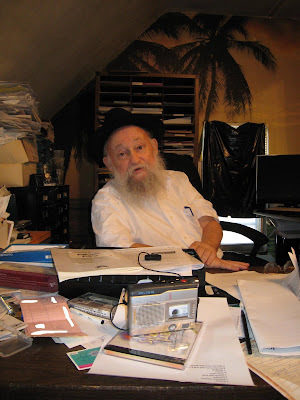 The Chaim Berlin/Fruchthandler people had put down a lot of money already by the time the Belzer Rebbe sprung his trap on them, and many tens of thousands of dollars went down the tubes twenty years ago in the belief that they were all set to build their Yeshiva Pachad Yitzchok in that prime location. They soon found out that the Belzer Rebbe had, by hook and by crook, somehow gotten people in the Jerusalem municipality to give him a permit to build his place there too, leaving the Chaim Berlin people steaming mad, and causing Abe Fruchthandler a hefsed merubeh even by his standards. Of course the shame there was being outplayed by the Belzer Rebbe in a real estate deal, which is what Fruchthandlers do for a living. We look at today's Rebbes, and we see how they've basically re-invented themselves. Although we talk of the Heilige Ruzhiner as the exception to the rule of his times, today the Rebbes have all said "Ich Bin Ein Ruzhiner." At least when it comes to the "Malchusdige" aspect of it. With the expensive dishes, and made-up homes, with the trips to Switzerland, and the grandiose Simchos, nothing is simple anymore. However, what we do see today is, that while in years past most of the Rebbes hosted people in their own homes, with the Rebbetzin slaving away for days preparing food for all the guests, today that aspect is gone too. There may be an Hachnosas Orchim thingie going on, but it's impersonal at best. Rebbes are very afraid that people will see that they're human after all, and that maybe they like to eat the supper leftovers from the pot on the stove just like us normal people. Yes, yes, I know, Lubavitch, too. OK. Who started this new seder? was it the press, the fact that they cover everything the Rebbes do? I don't know. Take a look at the picture we have here, brought to you, as always, by הרוצה בעילום שמו. 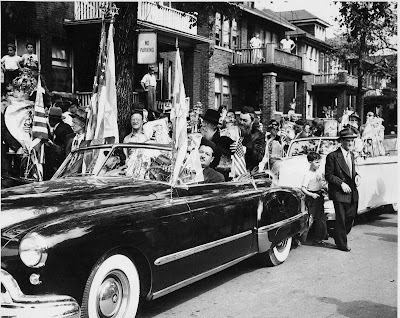 This is a Hachnosas Sefer Torah in Detroit in the late '40s or early 50s, at least that's what the car tells me. The two gutte yiden riding in the back of the convertible (!) are Reb Moshe'le Schneersohn-Twersky of Tomoshpol (l), who was a 5th generation descendant (ben achar ben) of the Alter Rebbe and was Niftar in Crown Heights in 5719, and Reb Yosef Benzion Rabinowitz of Arel-Brezna,(r), who's holding the Sefer. Reb Yosef was an Eynikel of Reb Gedalia of Linitz, and a Tchernobler Eynikel too. That's where the Tomashpoler Rebbe comes in here; he too was a Tchernobler Eynikel, a grandson of the Cherkaser. Reb YBZ was Niftar in Tel Aviv in 5728, I'm told. The Rebbes of today would almost not want the whole Hachnoseh ceremony if that's the way they'd have to ride, like a couple of teenagers having a good time cruising around town. And the flags! my goodness, look at those flags! In the old days the Rebbes would ride around in open buggies and in convertible automobiles, the ones with the tops down. It wasn't a Pechisas HaKoveyd for them either, they were quite content. Today everything is Achshir Doroh. Most of you should know by now about the grandiose Bar Mitzvah of Sholom Rokeach last week. Belz seems to do that alot these days, go all the way with their Simchos. 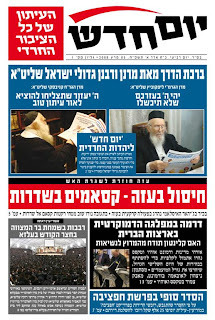 The Belzer Rebbe supposedly told people not to publicize the events until the week of the Simcha, yet the publicity it generated and received is hard to top. Anyway, no Belzer with a shred of self-respect was seen on the street in Boro Park. If, for some reason, he couldn't make it, then he was holed up in his house, not daring to show his face. the event was covered by a horde of media people, frum and non-frum, Jewish and Non-Jewish, and every move was scrutinized, including why the Boocher sat on 4 plastic chairs, when all he's the main event... 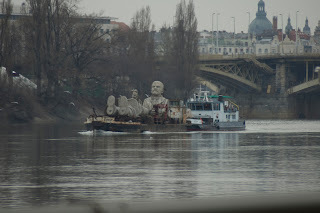 The Belzers were quick to respond that it was the youg lad himself who asked for a stack of chairs, being that he couldn't see what was going on!!! What is it about Belz that has seen the exponential growth happen in the last 50 years? Is it all about the legacy of Belz that attracts all those people? Is it the charismatic personality of the Belzer Rebbe Shlita? Many would say that he banished and was merachek almost as many old Belzers as later joined Belz. Those who left felt that due to his personality Belz may not have a Minyan of Mispalelim very soon, and that all would leave. they also saw the previous Belzer Rov as irreplaceable, the fact that he a nephew not withstanding. Yet, 40 years later, it seems like he's the one who has the laugh, with thousands upon thousands attending his Tishen, Yomim Tovim, and Simchos. It would to me, the unaffiliated one, that they love and respect him tremendously, which would make think that it's a Bechinah of Kemayim HaPonim el HaPonim. Otherwise I see no reason for the growth. Some would say that it's not him they're there for, but for "Beis Belz," the fact that Belz must go on. Maybe. One thing we know; He does as he pleases, and I mean that in a good way. No Gabbai or Eltere Chossid tells how he should do things. He kept those he liked and threw out those he saw as a threat to his Rebbistive. People said he was crazy, that he'd be nothing without them, but he had the last laugh, and nobody questions him, at least not on the surface, and he does as he pleases. The examples are countless, starting from the unthinkable; the talk against the Satmar Rov and the break away from the Edah HaCharedis. I need Rabbonim, you say? I'll make my own Beis Din, complete with womb to tomb services, anybody who's born here can die here 120 years later without ever having to leave. His joining with Degel HaTorah awoke the wrath of many, especially in Lubavitch, but even more so his FIL, the Vizhnitzer Rebbe, Shlita. After the attack last week on Mercaz HaRav word spread that the Belzer Rebbe attended the Levayas. That won him brownie points. Then the pictures of his visit to one of the wounded in Sha'arei Tzedek Hospital began to surface. That scored tons of points. Some Belzer ruined the good feelings by announcing that he was there visiting his mother anyway, not that he made a special trip. Whatever. It still shows that he's following his heart/gut feeling, and all these steps add up. Even I was impressed. 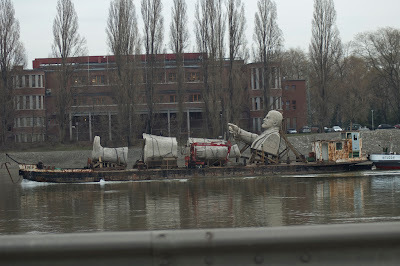 Where Are They Taking Lenin? Tzemach sends regards, and says "Crown Heights." In the wake of the massacre at Mercaz HaRav, discussions take place, especially over Shabbos. Ultimately, after discussing the horror of the actual massacre, the discussions arrives at what political Matzav allowed for this to happen. 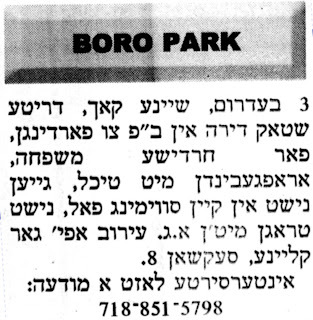 Of course we all believe MeyHashem Yotzo Dovor, and that altz is bashert, but we do need to out part, just like we fight for housing when it comes to Brooklyn and Lakewood. So, we got to talking about why nobody seems to see the light of the Rebbe's ways, of how the Rebbe warned that any and all talk about giving up land only empowers the Terrorists. After all, Lubavitchers like to see things their way, as do most other people. The Rebbe spoke, and screamed, and yelled, about the danger that even discussing giving land to the Terrorists would do, but people laughed. They pointed to the supposed treaty with Egypt, and said "look, we're friends!" Yet, many failed to notice that just this year, even Rav Elyashiv shlit"a, 30 years after Camp David, said that the piece of paper Sadat signed means nothing, there is no peace. At first they said that getting favors from the Government was more important. I remember one of the Ziknei HoAdmorim, may he have a Refuah Sheleimoh, speaking out during Shalosh Seudos against what a Lubavitcher MP had done to bring down Peres' Government. He mentioned the fact that his Yungeleit darfen hooben deeros, and that was more important to him than the Golan Heights. His way of getting Deeros was supporting a Government that would give away the Golan but would repay the Frum for their support by giving them Deeros and more money for their institutions. When Peres' Government fell he lost his Deeros, so he lashed out against the Rebbe. 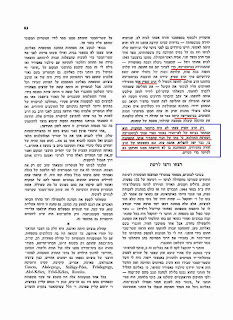 I bear him no ill will, farkert, I respect him very much, but now that Hamas runs Gaza, (maybe in part to some frum people and leaders and political parties not worrying that the Dati LeUmis getting uprooted from their communities would affect them, and that they deserve it for believing in Zionism in the first place) his Deeros, the ones he eventually got in Ashdod, the ones parents went into perpetual debt to buy for their kids, are within range of the Kassem missiles we thought would only bother Sderot, a town nobody ever heard of, but are now harassing Ashkelon as well, r"l.
Today, even those that were indifferent about the plight of those banished from their homes, because why should we spend all that money and manpower to protect 7,000 Jews who live there just to provoke the Arabs, see the mistake they made. They too see the Kassems as a direct consequence of the disengagement. But instead of seeing the err of their ways, they point to the National Religious and laugh at how they still believe in the State, even after the Holy Tzahal threw them out, and destroyed their homes. Never will you see an apology for them going along with the disengagement, even as the Kassems fall. We in Lubavitch never doubted the Rebbe's words, and we see the manifestation of what peace talks can do, but those who laughed, and pointed to worthless pieces of paper like what Begin signed in Camp David as proof that peace works, and that it should be the course we take with all Arab parties, those people are the stubborn ones here, and they'll continue to be, even asd they need to evacuate their own homes, r"l. To them I say, It's OK to apologize, and it's ok to demand a change of course from the Government you send Charedi MPs to in order to get the educational and social services funding you so desperately need. YeshivaWorld Breaks From "Daas Torah!" Mr. YW, by hosting Rabbi Yehudah Levin of "GayWatch," who openly criticizes the Agudas Yisroel and Degel HaTorah, amongst others, has shown that he too is part of the crowd that knows better than Rabbonim and Gedolei HaTorah. Levin proudly boasts of his experiences in pressuring Rabbonim to follow his agenda, and shows that he too is like those "Askonim" who tell Rabbonim what they need to do. A 55-minute almost uninterrupted rant against Rabbonim and their Shluchei Mitzvah is hosted on that site, and the silence is deafening. This is despite YeshivaWorld's claim to speak for the Yeshivishe and Heimishe Community. Let the record show that Hirshel Tzig, a "Chabadsker anti-Semite" who's been told he's not part of "Klal Yisroel" is the only one that was Moche against this travesty. Let all those who belittled and derided me come and beg forgiveness. Recently the Williamsburg Satmar Rebbe made a Nesiyah to Europe. First to the Kivrei Avos in Hungary etc., and then to Antwerp for a Shabbos and wedding. His wife also made the trip, since her brother is the one marrying off a child in Antwwerp. It seems like his wife fell ill, had appendicitis or something while in Hungary, and had to be hospitalized. The Aronim, the Chassidim of his older brother Aron, are upset at him, and never miss an opportunity to scorn him. Although they claim to have a much larger crowd, both in Williamsburg and over the world, they're still very bothered by him. What gets me is how they're so sure that he's miles ahead of his brother in both Torah and Avodah, yet they don't miss a chance to belittle him. Is it all because of the shul in Williamsburg that they so need? Can they not survive without 152 Rodney? If he's so insignificant let him have his supposedly empty shul and his few people, and you enjoy your Rebbe and his thousands! But no! They need it all, and they won't rest until the man is dead and buried, you'll excuse me. Every move the man makes is scrutinized and ridiculed by his brother's people, to the degree that even an outsider like myself, who hasn't really an opinion on who should lead, is swayed to the other side. They need to make sure that the brother has nothing and never will. They drag the now-deceased father through the mud by making him look like a fool who was taken advantage of for 5-6 years by a shrewd Gabbai named Friedman, who now controls the son as well. Soon, they say, that Friedman will turn on the son as well, and appoint somebody new, maybe the Brother-In-Law from Monsey, they say. Zol Zei Voyl Bakummen, I say, that's not the real thrust of the thread here. What bothers me is what they recently posted on one of their HydePark forums, when the Williamsburger's wife fell ill in Hungary. It seems like they think that the Shidduch he made is not prestigious enough, it's only epes ah Rov from Rumania, Rav Spitz from Bistricz, not someone like the daughter of the Vizhnitzer Rebbe from Bnei Beraq like their Rebbe married. 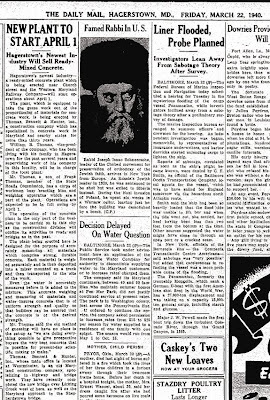 So, they went and dug up an old Yizkor Book from Silagy that speaks about Rabbi Spitz and what he endured during WW2. I guess the fact that their Rebbe's father ob"m made the shidduch for his son, and wasn't concerned about what may have happened years back, doesn't count for much in their books. Just Read It. Then tell me what you think. I don't want to write it out in English. Far be it from me here to take away a person's right to self-esteem, Hashem knows I suffer from a lack thereof, and I wouldn't wish that on any other Yid. I think being comfortable with what you do, and feeling like you're an important part of any operation is key to success. But what I've seen recently in some circles has begun to irk me, and increasingly so. I've started to see a group of mostly ordinary people, with no major inherent Mayles, who seem to think that G-d must not have created the Gan Eden that could be big enough for them. They take themselves very seriously. I speak of a certain group of Baalei Batim, Yeshivishe BaaleiBatim, to be exact, and not the ones who struggle to make a living either. They see to have the best of both worlds, they live a good life, the two cars and a manicured lawn life, and have time for G-d too. They make time for learning, yet have time for eating out and other Moysros. They lack very little; The kids have Shabbos suits, shoes, and a Borsalino on every Bar Mitzvahed head, and they daven Mincha before the Shekiah too, c"v not angering G-d by praying after the Zeman. They also don't bother with unimportant things like Chassidim do, always sticking to the basics, and never deviating from the Mesorah. Why would I belittle those who follow the Mesorah and daven in a timely fashion? I'm not, much as you'd like me to. I also Fargin those who have the means to buy the Beste Un Di Shenste when it comes to honoring Shabbos and Yom Tov. What irks me is the love affair, the self-gratification that screams from these people, as if Beshvili Nivra Ha'Olam means that G-d created all this just so I should be rewarded for my good deeds. I always knew that we were never done working hard, and that we should never believe in ourselves, they seem to think differently.